Dei Baci Rubati - ALL THE PICTURES FROM CAROL X BENTHO'S PUPPIES - TUTTE LE FOTO DEI CUCCIOLI DI CAROL X BENTHO ! We here reported new pictures of Multi Ch. Bentho Ibn Greco de Bruine Buck x Ch. It. Christmascarol's puppies, who were born on September 30th. Aren' t they lovely ? - Ecco a voi nuovi "scatti" dei cuccioli nati dal Multi Ch. Bentho Ibn Greco de Bruine Buck x la nostra Ch. It. Christmascarol. Non sono un amore? S.r. Ch. 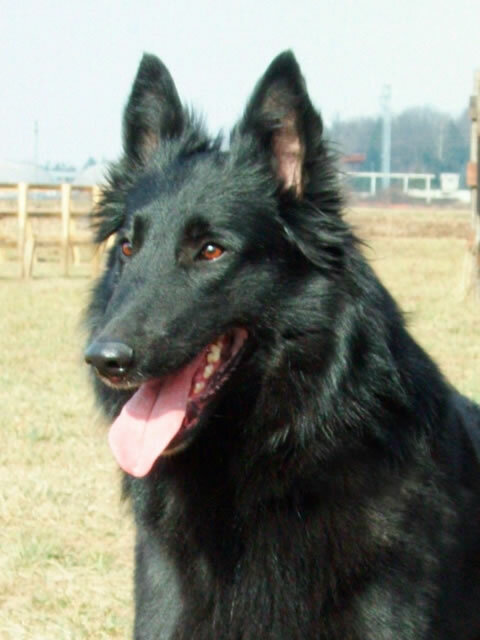 NL + LUX+ GERMANY + DKBS + FRANCE, Bundessieger 2004, Jahrhundertsieger 2006, Best male of French Championship & National Specialty, super character, exams VZH, UV, char. test with biting in FR and NL, HD/A, Breeder: T. en R. Roozen; Owner:Jolanda & Duncan de Bruin; born on: 26-05-2000. We thank so much Tom Roozen, De Bruine Buck breeder, and Jolanda de Bruin, Bentho's owner, who allowed this breeding. A special thank to Jolanda for her friendness and collaboration! 1° Exc. Working Class French Championship 2003 (STRASBURG), 1° Exc. Working Class PARIS DOGSHOW (Vincennes Specialty 2004), CANT, Championship TAN Exc, Sheepdog Trials (Level 1). 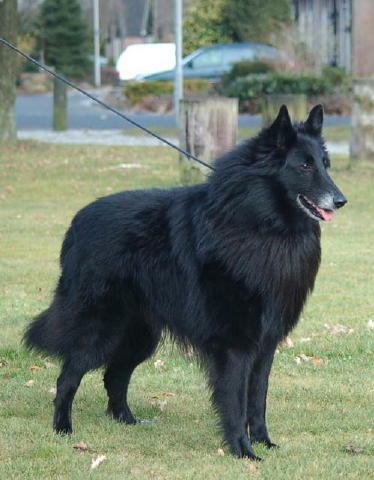 Christmascarol is the only Groenendael in Italy working sheepdog (trial 1). She as an excellent temperement, very stable, friendly and strong at the same time. La lice Ch. It. CHRISTMASCAROL (RE Rik de Condivicnum x Ch.It.Re. Selene),1er Exc. Classe Travail Ch. France 2003, 1er Exc. Classe Travail Paris Dogshow 2004, CANT, TAN Champ. Exc, Concours interraces ovins Niveau 1, HD/B, a été saillie le 29/07/2008 par l'étalon S.r. Ch. NL, FR, LUX, ALL, DKBS, Bundessieger 2004, Jahrhundertsieger 2006 BENTHO IBN GRECO DE BRUINE BUCK, Meilleure male Ch. France et NE, HD/A, Éleveur: T. en R. Roozen; proprietaire: Jolanda & Duncan De Bruin. (pointage: 3+4). Christmascarol est le seule Groeoendael en Italie qui a participé à des concours troupeaux. Elle a un tempérament excellent, très stable, sociale et fort au même temps.